Hype in this current gaming climate can be dangerous. Every few months, a torrent of hype builds around something in gaming that, for better or worse, stirs gamers into a frenzy. This latest thing happens to be the third installment in a franchise that has seen amazing highs and the sting of utter mediocrity. It was lauded with so much praise that it hearkened to memories of Daikatana, or more recently the utter trainwreck that was Duke Nukem Forever. 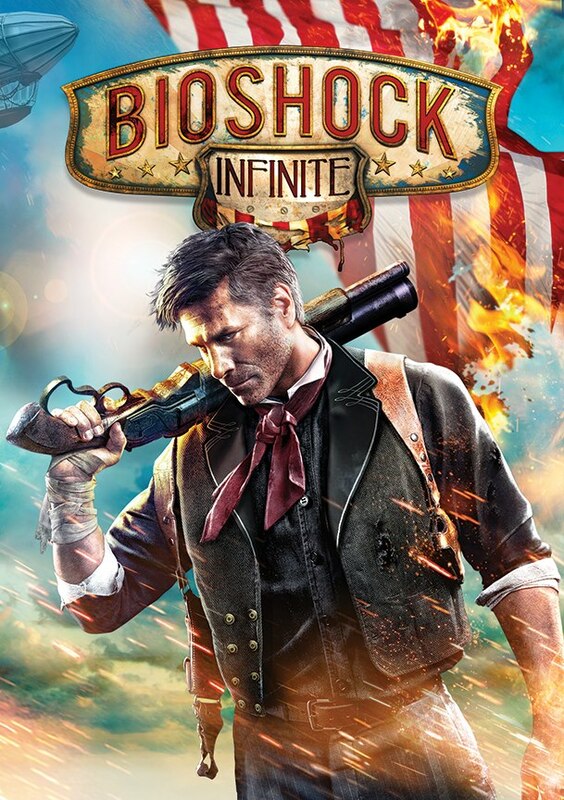 This game is Bioshock Infinite, and while it was an awesome game and easily one of the best titles to be released this console generation, it was bogged down by expectations that no video game could possibly live up to. While the first two Bioshock titles were set in the underwater city of Rapture, Infinite is set in the flying city of Columbia, decades before the events of the first game in the series.The player takes control of a man named Booker Dewitt who is charged with rescuing a girl named Elizabeth from a tower in Columbia. Dewitt's arrival and subsequent actions within the confines of Columbia prove to cause a considerable ruckus, pulling the pair into a rebellion among the primarily Black poor population of the city, pitting you at odds with what initially appears to be the supernatural. The story takes twists and turns and involves a twist that you may not see coming if you aren't heavy into science fiction stories. Gameplay is well done, yet nothing new. Bioshock Infinite is at it's core a First Person Shooter, and you have to appreciate that genre and it's quirks in order to even remotely enjoy this game. All the elements needed to make this a great shooter are present, though: fast paced action, enemy AI that isn't utterly idiotic, responsive control, and Elizabeth's special abilities prove to be quite the asset. Boss fights in Bioshock are quite epic in the grand scheme of things, and there's a moment where the character you initially think will be your final boss fight ends up being quite an ally. The weapon variety is pretty solid, with standard fare like machine guns, shotguns, pistols, sniper rifles, and rocket launchers. Then there are the Vigors, which serves as the replacements for the Plasmids from the first two games. They run the range of defensive and offensive abilities from enemy possession to elemental attacks. It's all pretty cool, but nothing that hasn't been done before. The best part of this game, besides it's obvious good looks, has to be Elizabeth, as she serves as more of an assistant that a damsel. she will regularly find health and ammo refills during battles and money during calmer moments and she she picks locks during the game, making it possible to access new areas and find new items. Her presence in the game is definitely welcome, as she turns the damsel in distress trope regularly seen in games on it's head. Another notable character is the leader of the Vox Populi movement, Daisy Fitzroy. Fitzroy is the primary character of color in the game, and as leader of this rebellion movement, she proves to be a formidable character. It's sad that she doesn't take a larger role in the game, and she would be a strong playable character for upcoming DLC. Bioshock Infinite is a solid game with stronger story elements and aesthetics than gameplay. It's easily one of the best games of this console generation, but given the general overall quality of many "major" releases this console generation, that may not be saying much. That isn't to say Bioshock Infinite isn't worth a purchase. If you need something truly special gameplay wise to get you to pay $60 or more for a game, you may want to wait for this one to drop in price.